My TRP Forgotten my USERid - How to Recover? The tax return preparer (TRP) logs into your account prepared by him for filing the income tax; however next year he may forget your username and password which might have had been used by you or him for e-filing or you may switch to a different TRP. Not to worry as the TRP can recover the user id and password by using the previous year e-filing report as it has acknowledgement number which helps one to recover the old user id and password. So; you have to just keep your old acknowledgement for the income tax filing and you will be easily able to recover your e-filing userid and password. You can check out that who can become a TRP here. 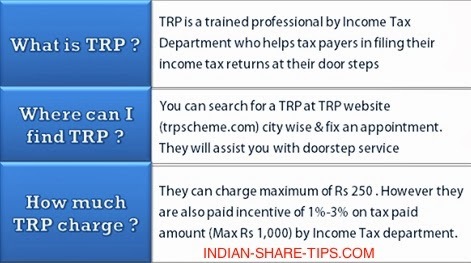 You can know all about latest income tax advise on the site by clicking the give link and remember to file income tax correctly as at times correct filing helps you get refund and do not forget to take second home loan rebate as this rebate helps you pay at least three EMIs.